← [fr] Le mouvement des “Forconi”: extrême droite ou révolte spontanée? The new “pitchfork” protest – nationwide this time – was announced weeks ago but it still seems to have taken the whole country by surprise. It began on 9 December and is still going on today, the organizers declaring that they won’t stop until the Letta government collapses. Even though it’s highly unlikely that the government would collapse as a result of a protest like this, and even if the numbers of participants are low, there are many features that look a bit unusual and that are being discussed both in the mainstream media and in left-wing and radical circles. Where does the protest come from? The protest was called by agricultural entrepreneurs’ and truck drivers’ organizations and by committees, all linked to far-right and right organizations (from Berlusconi’s PDL party to the neo-fascist Forza Nuova, CasaPound and La Destra). The main demands are typical of a Poujadist and anti-European Union right-wing movement: return to monetary sovereignty, protection of Italian companies and products, reduction of taxes, an end to corruption and the collapse of the government with new elections. The demands are accompanied by nationalistic evocations of Italian culture, its beauty and potential, and by continuous calls to the Italian People. In a typically right-wing view, the Italian People is an homogeneous entity, workers and entrepreneurs, employers and employees all together against the common enemy of the “caste” of politicians, international organizations, the media and unions. Needless to say, this view provides an easy safety valve as the crisis is hitting harder and harder with no end in sight, taxes are increasing continually and the traditional political institutions are stuck in the mire. The protest began with people blocking highways and main roads in several, mostly Northern Italian, cities. The only place where there were sufficient numbers of protestors to really disrupt the city, though, was Turin. Many shops were closed, a picket of truck drivers stopped business at the General Market, and there were traffic jams in many places. In centrally-located Piazza Castello, fascist militants and football ultras marched with many high school students and youngsters from the suburbs and there were violent clashes with the police. Meanwhile, in nearby Piazza Palazzo, migrants and left-wing activists were demonstrating for refugees’ and migrants’ rights. The Turin sociologist Marco Revelli described what he saw in the squares of the city as “a crowd of the poor. Or, rather, of the ‘impoverished’. The many faces of poverty today. And, most of all, of the newest one.” The situation in Turin seemed different from the rest of the country because of the class origin of the demonstrators and the numbers of participants (several thousand on the first day). Elsewhere, there was only a smallish number of protesters, the majority from the neofascist movements. They were joined by a mixture of enraged people, from fairly wealthy entrepreneurs complaining about high taxes to small entrepreneurs, shopkeepers and artisans strangled by the crisis. Everywhere, the Italian flag and the national anthem were used to express the nature of the demonstration: Good Italy protesting against Bad Italy and the European Institutions (the “caste”). During the following days, some groups of protesters continued to blockade the streets and keep a presence in the cities’ main squares but in decreasing numbers. On 10 December there were still several hundred people involved in blockades and rallies in Turin and the city was once again paralysed. 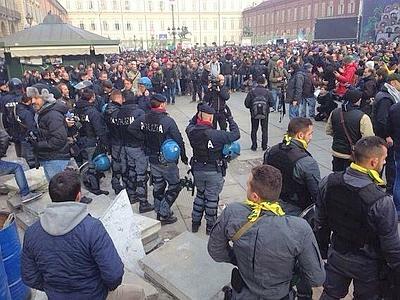 In front of the Region of Piedmont’s building, a Forconi rally was confronted by a demonstration of FIOM (CGIL) Union factory workers, and the police had to separate the two groups. The Forconi protesters argued about the presence of the union, shouting abuse and claiming the legitimacy of only one flag, the Italian one. Witness statements bear testimony to some of the strange things about this demonstration. Many shopkeepers all over Italy were threatened and even attacked violently by the protesters, forcing them to close their shops. The same thing happened to truck drivers. Some people point out that Turin’s General Market (one of the most important logistics and commercial junctions in Northern Italy) was blockaded by around 300 demonstrators, leading to losses of millions of euros. It is generally known that the mafia has a large presence in this market and the surrounding area. The blockade at the General Market was lifted by the demonstrators on 11 December and until then there had been no intervention by the police. The police seemed to keep a low profile everywhere, and in many places mere tens of people were able to blockade a street with no reaction by the security forces. This unusual behaviour by the police – compared to the violent reaction they often use against less damaging protests – went even further. In some places, police officers removed their helmets in a very theatrical way in front of the demonstrators, prompting applause and chants about the people and the security forces being united. In many places, the police seemed to show solidarity rather than indifference, even when the protesters were not behaving in a “democratic” manner. In Savona, for example, a small number of demonstrators blockaded the main streets for two days and also attacked a left-wing bookshop, shouting threats and yelling “Burn the books!” Despite this, the police expressed their solidarity with them. The heads of the security forces denied that solidarity was being shown and talked about normal policing activity yet the police unions (like the COISP) stepped forward to express solidarity once again. Beppe Grillo, who kept his Movimento 5 Stelle far from the protest at first, then took advantage of the events to write an appeal to the security forces asking them to stop protecting the politicians and to join the demonstrators. The main thing to underline is that, despite the small numbers of protesters, the demonstrations were on the front pages of newspapers and news websites. Right-wing oriented newspapers tended to support the protest, trying to exploit the wave of anti-government feeling and attacking Prime Minister Gianni Letta and the European Institutions. Journalists and commentators from many newspapers are still trying to work out how the “pitchfork movement” is made up, analyzing the different types of protesters they have seen on the streets (mainly in Turin, where the biggest demonstration took place). The presence in some cities of people linked to criminal organizations is not really being looked at although social networks are putting forward good evidence of this. While there is no doubt about the reactionary nature of the organizers, a huge and controversial debate has begun about the composition of the protesters and intervention by radical political forces. The controversy originated on the Infoaut website, voice of autonomous action and based in Turin. In a series of articles (referring mostly to Turin) Infoaut stressed that those squares where suburban young people and impoverished shopkeepers were present had to be the places where radical left-wing organizations should intervene. 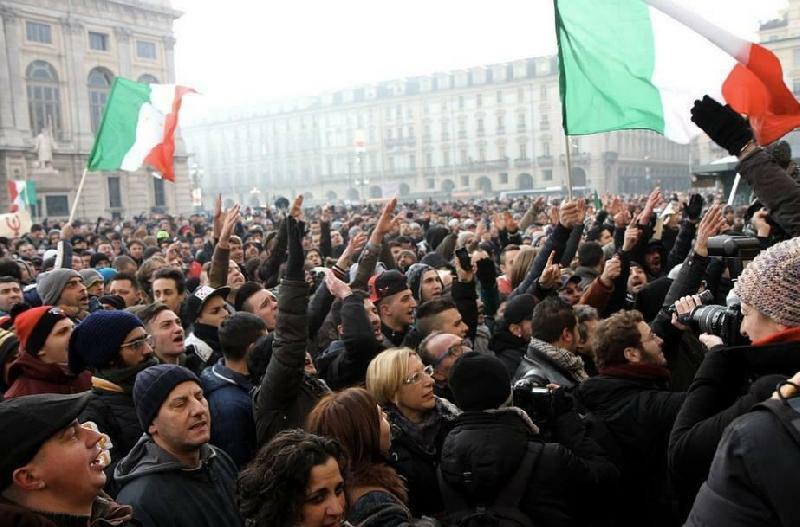 They also made the leap to compare today’s protests in Turin’s Piazza Statuto with what happened there in 1962, when a new generation of young and often Southern factory workers from the Fiat and other big factories started to strike and to clash. These new and struggling factory workers were different from the old workers who had been partisans during the Second World War and were loyal to the Communist Party and the union. Infoaut’s intention, they said, was to “get their hands dirty”, unlike those people who remain inside left-wing enclaves gazing at beautiful but sterile ideologies. The articles were received with scepticism by some other left-wing groups and organizations. Contropiano, website of the “Rete dei Comunisti” organization, highlighted the heavy presence of neofascist groups and the need to build a common front with strong political content, without trying to occupy every political space that appears to look like a revolt. They also hypothesize that the protest, in the intentions of the organisers, is an attempt to build a social reactionary front that opposes to the crisis in a way that does not challenge the system. Other less radical organizations, such as ANPI (the national association of partisans, an organization that may appear superficially to be part of the distant past but is quite active in current Italian politics), have even called for counter-demonstrations to protest against the neofascist presence among the “pitchforks”. This entry was posted in Activism, Alternative media, Grassroots movements, Mafias, Mainstream media, Media, New Fascism, Politics, [en] and tagged demonstration, forconi, pitchforks, police, protest, Turin. Bookmark the permalink. Thank you for a thorough round up of these stories. Really appreciate your work on it. Manuel Castells writes in “Networks of Outrage and Hope” that these “relentless social movements” are all borne out of “individual and collective outrage towards social injustice and the degradation of living conditions faced with humiliation from the authorities” and when politicians are not listening and acting on the expressed needs of the people, the extremists (right wing or other) easily appear and take their place with populist rhetoric and violence. Your reportage illustrates his words scarily.